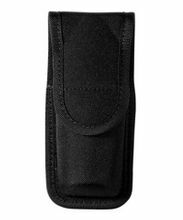 Black hard form holster for Mark 4 sized pepper spray/oc/mace cans. Stays firm to allow one-hand grab of chemical sprays. Fits Fox Labs 4 oz, Defense Tech Mark IV, Police Magnum 4 oz., Sabre ML-120L and similar sizes. Has flap fastened with hidden snap. Fits 2.00 and 2.25 inch belts.